Chrono Trigger is, even among usually PC exclusive gamers like me, a legend. It’s held up as one of the best games ever – developers point at it and say that this is how you make a game for a console, that this is how you make a game that transcends cultures. 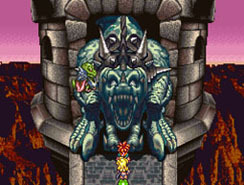 They point at it and say that Chrono Trigger is how games should be made. I have to confess though that, for the longest time, I had no idea why. I’d never played it. In some of the more haughty circles of games journalism that’s the type of thing that I’d be made to feel bad for, but I’m not wholly bothered with all that frankly. I had an Amiga A500+ when I was growing up, not a NES, and I favoured my IBM compatible over my PlayStation One. Sue me. Now that I’ve had a chance to sit down through a couple of achingly-long commutes to our new offices at Dennis Publishing, I’ve finally got around to playing it on the new Nintendo DS. I can see what all the fuss is about. 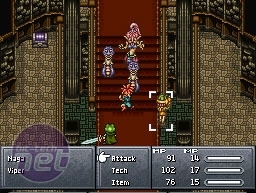 Ironically, given the themes of the game, Chrono Trigger has aged very, very well. Chrono Trigger centres itself around the fictional continent of Guardia, which at first seems to be that old idyllic stalwart that’s popped up in pretty much every Square Enix game. It’s a world where people fight with swords and live in hand-built houses, but clockwork robots and dragons are an everyday occurrence. 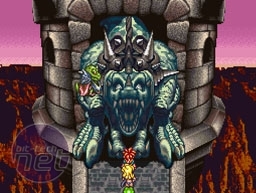 In Chrono Trigger, the ‘bots and beasties are only the tip of the iceberg. There’s a new technology on the horizon – one which may have arrived a bit prematurely. Teleportation, developed by the childhood friend of the player character, Crono, is about to be unveiled at a fair that celebrates a millennium of peace for Guardia. As always happens though, the experiment goes awry before your eyes and the world is plunged into a jeopardy that only you can save it from you. An accident with the telepod has pulled your friend through a hole in time, dumping her in Guardia’s middle ages and massively disrupting the timeline. She bears a striking resemblance to the then-missing queen, you see. Again though, that’s only the start of things. As you rush to save your friend and correct this innocent mistake, time itself starts to unravel around you and new evils edge into view. You’ll have to literally journey to the end of time in your quest to not just restore the world, but to save reality itself. So, yeah; drama. 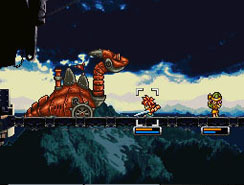 It would all seem too much to bear for the teenage Crono, but luckily he’s one of Gordon Freeman’s forefathers – silent and restricted to just getting the job done, one way or the other. 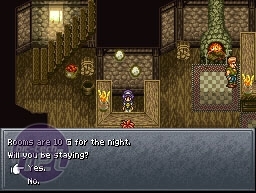 To label Chrono Trigger as restrictive though wouldn’t be entirely fair. You’re limited to an essentially linear plot, true – but there’s a huge freedom of movement here too. Even the smallest things you do, like stealing someone’s lunch or walking off when an ally is talking, can change things later on. Butterflies, tidal waves and all that. 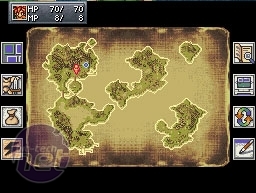 The story itself then is pretty unique, giving players a chance to view the results of their actions from multiple viewpoints. What really brings the story together to make it so good though is the presentation. 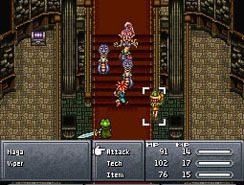 The colourful appearance of the characters and the interface, the familiar layout of the town and the juxtaposition within it of events past, present and future. 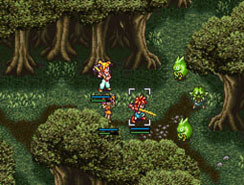 The dialogue is kept trimmed down and well edited too – a skill many JRPG developers these days could stand to re-learn.